This is the best way to safely explore the terrain away from the piste and make your own tracks on pristine slopes in powder filled gullies and tree lined alpine meadows. This course is for intermediate to experienced ski tourers who want to learn to tour independently in the mountains safely – to plan and execute their own trips. This is how to get the best lift accessible skiing possible. Your mountain guide will know where to find the best snow and lead you on exhilarating descents – whether high mountain lift accessible skiing on glaciers and mountainsides or steep and deep powder in the trees. Leaving the safety of prepared ski areas in winter can be extremely dangerous without a guide and is not advised. The advantage of off-piste skiing with a guide is that they are aware of the avalanche conditions and have detailed knowledge of the snowpack. This means they will show you the best skiing possible whilst remaining safe from avalanche danger. Off-piste skiing is possible for skiers wanting easy powder turns away from the ski area up to the hardened skier wanting to ski lift accessible steep descents. With great local knowledge of all areas in the Chamonix valley and the Éspace Evasion – Megeve, St. Gervais, Les Contamines and Courmayeur in Italy and further afield you’ll be sure to get good skiing. Due to the different aspects and altitudes of these areas an off-piste day can be run to cater in almost all conditions for clients at all levels, from spaced tree skiing to the world famous Vallée Blanche above Chamonix. Suitability: Off-piste skiing can be physically demanding. The aim of these days is to get maximum skiing available from the lifts so expect tired thighs from blasting through all that powder! You will require appropriate skis and avalanche safety equipment: Transceiver, shovel and probe. If we head onto glaciated terrain then a harness will also be required. If you have any questions regarding ski equipment then please get in touch. Insurance which must include provision for helicopter rescue (Mandatory). If you require recommendations for insurance providers then please get in touch. Ice axe, crampons, harness and helmet can be provided for a hire fee of £12/€15 per day. Skis and safety equipment can be arranged with Concept Pro in Chamonix. They are located next to the Aiguille du Midi lift and my clients receive a preferential rate on all equipment rented. Pre-booking equipment is essential especially during holiday periods. 2800m and 21km of descent awaits you with deep powder and stunning glacial scenery as we descend the glacier du Géant flanked by 4000m peaks and fine mountain vistas. After negotiating the Géant icefall we will ski down the incredible ice architecture of the famous Mer de glace towards the train station at Montenvers where we may finish. If there is good snow cover we will continue past this and make a 20 minute hike carrying skis up to the buvette de Mottets for a refreshing drink before a forest track leads down through the trees to arrive back in Chamonix at 1035m. There’s no better feeling than bouncy powder turns high in the mountains under blue skies! Suitability: The Vallée Blanche is a physically demanding long ski and the (roped) descent of the ridge is exposed. There are several variations to the descent, some of which can be quite steep. You need to be a confident and good off-piste skier capable of staying in complete control in a variety of snow types. The descent to Chamonix below Montenvers is a particularly narrow tree lined track which requires complete speed control in tight spaces. This descent is reserved for experienced skiers. The Vallée Blanche can also be descended under the full moon. Conditions for this descent are elusive but it can usually be done each winter. Please get in touch if this is something that interests you. You will require appropriate skis, a rucksack that you can carry your skis on, avalanche safety equipment; avalanche transceiver, shovel and probe, and glacier safety kit; crampons, harness and safety lanyard. Glacier safety equipment is provided for this trip, skis and avalanche safety equipment can be hired or arranged in Chamonix. Ski touring is the best way to travel through the mountains in winter and spring. 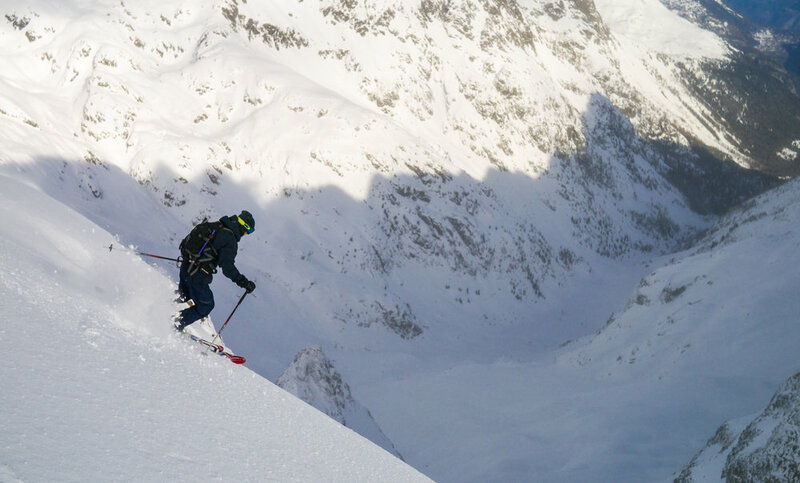 Touring can be as straightforward as escaping the pisted areas to find fresh powder in a neighbouring valley to a technical ski tour involving climbing, abseils and steep skiing – real ski mountaineering terrain! In spring there is no better adventure than a week long traverse of a mountain range, sleeping in high mountain huts, skiing your first 4000m peak or even skiing from the summit of Mont Blanc at 4810m! Blue skies, powder and a stunning backdrop – what are you waiting for?! Suitability: Ski touring is very varied so suitability for certain trips depends on your previous experience. If you have no previous ski touring experience then you should look at our introduction to ski touring course. If you wish to develop your ski touring and ski mountaineering then this can be incorporated into courses or look at the Ski Touring Autonomy course. Below are just a few suggestions, please get in touch to discuss ideas for a ski touring trip. We do not run any scheduled ski tours so all of our trips are custom made to suit your level and aspirations and will take into account the current avalanche and weather conditions to ensure you get the best out of your days in the mountains. Col du Passon – A classic from Grand Montets with a lot of bang for your buck! +750m, -2550m! The Gran Paradiso Traverse – A splendid traverse taking in the cols at the heads of the Valgrisenche, Val di Rhemes and Valsavaranche. Excellent touring terrain with friendly Italian huts and good ski peaks like Punta Galisia as a warm up for the finale skiing Gran Paradiso, 4061m. 6 days, up to 1:6. Mont Blanc – At 4810m Mont Blanc is the highest summit in the Alps and can be skied from the very summit. This is a taxing high altitude ski summit with exposed climbing and skiing terrain demanding high fitness, good mountaineering skills and strong skiing and is the high point of many a ski mountaineer’s career! The ascent can be made from late March to June and takes two days but with acclimatisation and preparation this trip is run over 5 days to give maximum chance of success. 5 days. Ratio: 1:1 or 1:2 conditions dependant. Ski touring takes place off-piste in the mountains and you need to be able to ski to a good standard being comfortable making turns of different radius in variable snow conditions. The course will be physically demanding so you should be prepared for days in the mountains ascending up to 1000 vertical metres a day on skis whilst carrying a pack and safety equipment. You will require appropriate skis fitted with touring bindings, skins, ski crampons and avalanche safety equipment: Transceiver, shovel and probe. If we head onto glaciated terrain then a harness will also be required. If you have any questions regarding ski touring equipment then please get in touch. 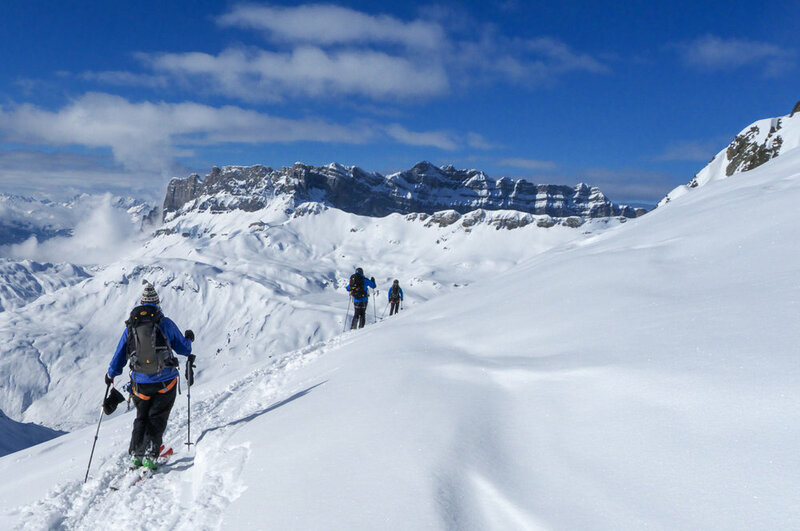 The objective of this course is to introduce you to the wonderful world that is ski touring. Ski touring is undoubtedly the best way to travel through the mountains in winter – climbing over snow covered passes on our skis to access hidden powder filled valleys and untracked snow. You will learn about the equipment required to ski tour and how to use it to travel both up and downhill safely. We will look at how to assess avalanche hazards and how to make safe route choices for the conditions. Avalanche safety and rescue training will be covered – how to conduct a transceiver search, probe and dig out a buried victim. These skills will all be taught in a practical environment over the course of the three days on the mountain. Suitability: This course is designed at an entry-level so is appropriate for people with no previous ski touring experience. As ski touring takes place off-piste in the mountains you need to be able to ski to a good standard being comfortable making turns of different radius in variable snow conditions. The course will be physically demanding so you should be prepared for three days in the mountains ascending up to 1000 vertical metres a day whilst carrying a pack. You will require skis fitted with touring bindings, skins, ski crampons and avalanche safety equipment: Transceiver, shovel and probe. If we head onto glaciated terrain then a harness will also be required. If you have any questions regarding ski touring equipment then please get in touch. The objective of this course is to help develop your ski touring skills, avalanche awareness and route choice to give you the skills you need to safely tour on your own and with friends. Happiness is blue skies and skis! You will learn more about planning ski tours and how to assess avalanche hazards and how to make safe route choices for the conditions. We will cover planning in detail using maps and current conditions to choose appropriate tours for the day. Navigating on skis and navigation tools will also be taught. Avalanche safety and snow science will be covered so that you can make observations on the hill and use these to make good route choice decisions. More advanced avalanche rescue will be taught including dealing with an incident and multiple burial situations. We will also cover ski touring in glaciated terrain; how to ski safely on glaciers and crevasse rescue. For mountaineers who wish to move into ski mountaineering the necessary skills for managing ski tours with technical sections can be incorporated into this course. These skills will all be taught in a practical environment over the course of five days on the mountain with the objective being that you plan and lead the final two days of the trip which could include overnighting in a mountain hut and the extra logistics and planning that entails. Suitability: This course is designed at an intermediate level so is only appropriate for people with previous ski touring experience who wish to develop and ski tour without the assistance of a guide. Your ski level is less of a factor as ski touring is not restricted to steep skiing and technical difficulty. Your previous touring experience is more important. As ski touring takes place off-piste in the mountains you need to be able to ski to a good standard being comfortable making turns of different radius in variable snow conditions. The course will be physically demanding so you should be prepared for five days in the mountains ascending up to 1000 vertical metres a day whilst carrying a pack and ski safety equipment. You will require appropriate skis fitted with touring bindings, skins, ski crampons and avalanche safety equipment: Transceiver, shovel and probe. As we intend on heading onto more technical glaciated terrain then a harness, ice axe and crampons will also be required. If you have any questions regarding ski touring equipment then please get in touch.